My nomination for stupidest judge ... no, make that my nomination for judge most likely to be in the pocket of Hillary Clinton ... goes to San Mateo CA Superior Court Judge Robert D. Foiles, the man who let Norman Hsu out on $2 million bail and didn't even ask Hsu to surrender his passport. Hsu obviously had connections to bushels-full of cash from contributors who did not wish to be named. Hsu was soon to become seriously tempted to name them. Judge Foiles, do you understand the concept of one plus one? Faced with judicial unpleasantness previously, Hsu simply disappeared for a decade and a half. Judge Foiles, has it ever occurred to you that when pressed, people exhibit their true character? REDWOOD CITY (LA Times) — The event unfolded like the judicial equivalent of a bride left at the altar. 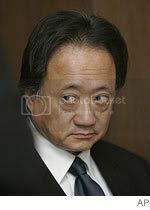 The mysterious political donor and fundraiser Norman Hsu was scheduled to appear in San Mateo County Superior Court on Wednesday to begin dealing with the fact that 15 years ago, he pleaded no contest to felony fraud charges and agreed to spend as long as three years in prison and then disappeared. But on Wednesday, instead of appearing in court and beginning to shed light on his affairs, Hsu again vanished, standing up Superior Court Judge Robert D. Foiles, Deputy Atty. Gen. Ralph Sivilla, San Francisco defense attorney James J. Brosnahan and two crisis-management executives -- not to mention leaving behind $2 million in cash bail. His failure to appear, echoing the events of 1992, was a shock not just to the court, but reverberated in the upper levels of Democratic politics, especially the presidential campaign of Sen. Hillary Rodham Clinton of New York. When this matter first blew up, the Clinton campaign, in true Clintonian fashion, agreed to give the $23,000 it got directly from Hsu to charity, but it refuses to let the amount he bundled for the campaign -- at least $77,000 -- out of their greedy, gripping hands. They also refuse to release the names of the bundled donors. If you can understand and justify those actions, congratulations! You know what the definition of "is" is. This is not rocket science, nor is it new. Hsu was funneling Chinese money into Democratic campaigns to buy influence. Again. The Chinese are chomping at the bit to get the sympathetic Clintons back in the White House and Hsu was one of their chosen agents -- and probably not the only one. The only ones professing to be shocked by this are the Democrats and their stooges in the San Mateo judicial system. The rest of us see it for what it is: Turning the other way while a bad problem slips away. Can We Say The Enemy's Name Out Loud Yet? This Guy Is Paid Millions? Good News! It's OK To Fly Nepal Airlines Again!